Creative re-use of existing urban areas is something of an obsession for me – I’m even moderating a dinner on the topic in a couple weeks. 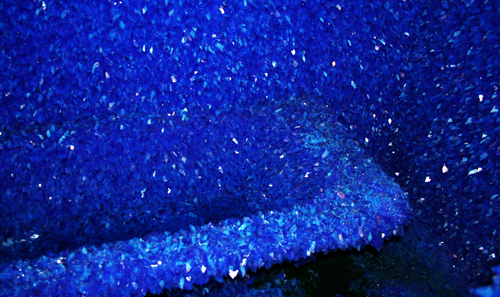 While my radar is tuned mostly to re-use done outside of formal cultural structures, Artangel is one organisation that always blows me away with their installations, and their latest work, Seizure by Roger Hiorns, is no exception. Sited in an abandoned housing estate in London’s Elephant and Castle, Seizure literally transforms the mundane state of 1970s London public housing into a magical, etherial experience. Hiorns and his assistants pumped 90,000 litres of a heavily saturated copper sulfate solution into one of the units in the estate, then returned almost three weeks later to drain the unit. Once the liquid was removed, what remained was a glistening, glowing unit, lined with Yves Klein Blue crystals, outlining the walls, light fixtures, and, yes, bathtubs, as shown at top. An exceptional project, providing an inspiring model for urban re-use, however fleetingly. 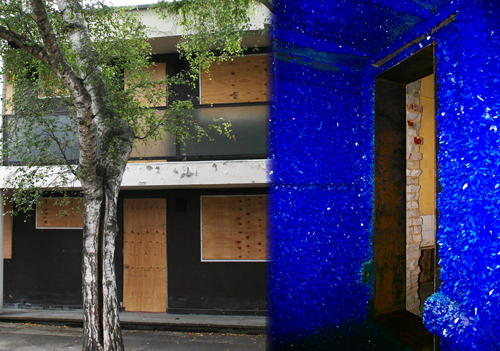 After the project ends on 2 November, the estate will be demolished. In the meantime though, it is the focal point for thousands of people who will navigate through one of London’s more uncelebrated boroughs and explore the shell of a public housing estate, providing a community of experience in an area where community disappeared a long time ago. More information on the project can be found here, and my flickr photo set on the project is here.